GFK is one of the world's leading research companies, using the latest technologies and smartest methodologies to help their clients understand and communicate more effectively with their customers. 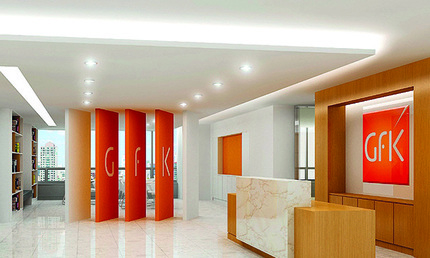 In Principle, GfK recognised an organisation with not only similar philosophies, but also an approach to consistent implementation of brand standards that would be required for its global rebrand. As a result Principle were commissioned to design, develop, produce and implement a signage family in over 300 locations around the world. The interior and exterior signage programme included illuminated building signs and totems, wall plates, interior wall and door signs, window vinyls and freestanding totems.